The FPGA market was valued at USD 4.79 Billion in 2017 and is anticipated to grow at a CAGR of 8.5% during 2017 and 2023. The growing demand for advanced driver-assistance systems (ADAS), the growth of IoT and reduction in time-to-market are the key driving factors for the FPGA market. Owing to benefits such as increasing the performance, early time to market, replacing glue logic, reducing number of PCB spins, and reducing number of parts of PCB, field programmable gate arrays (FPGA’s) are being used in many CPU’s. Industrial networking, industrial motor control, industrial control applications, machine vision, video surveillance make use of different families of FPGA’s. North America is the leading market for field programmable gate arrays with U.S. leading the charge followed by Europe. North America region is forecast to have highest growth in the next few years due to growing adoption of field programmable gate arrays. What is Field Programmable Gate Arrays? Field Programmable Gate Arrays (FPGAs) are semiconductor devices. The lookup table (LUT) is the basic block in every FPGA. Different FPGAs use variable sized LUTs. A lookup table is logically equivalent to a RAM with the inputs being the address select lines and can have multiple outputs in order to get two Boolean functions of the same inputs thus doubling the number of configuration bits. FPGAs can be reprogrammed to desired application or functionality requirements after manufacturing. This differentiates FPGAs from Application Specific Integrated Circuits (ASICs) although they help in ASIC designing itself, which are custom manufactured for specific design tasks. In a single integrated circuit (IC) chip of FPGA, millions of logic gates can be incorporated. Hence, a single FPGA can replace thousands of discrete components. FPGAs are an ideal fit for many different markets due to their programmability. Ever-changing technology combined with introduction of new product portfolio is the major drivers for this industry. What are the major applications for Field Programmable Gate Arrays? 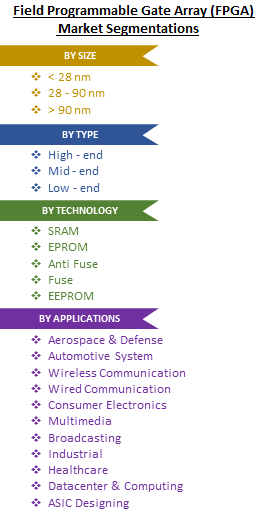 FPGA applications are found in Industrial, Medical, Scientific Instruments, security systems, Video & Image Processing, Wired Communications, Wireless Communications, Aerospace and Defense, Medical Electronics, Audio, Automotive, Broadcast, Consumer Electronics, Distributed Monetary Systems, Data and Computer Centers and many more verticals. Particularly in the fields of computer hardware emulation, integrating multiple SPLDs, voice recognition, cryptography, filtering and communication encoding, digital signal processing, bioinformatics, device controllers, software-defined radio, random logic, ASIC prototyping, medical imaging, or any other electronic processing FGPAs are implied because of their capability of being programmable according to requirement. FPGAs have gained popularity over the past decade because they are useful for a wide range of applications. FPGAs are implied for those applications in particular where the production volume is small. For low-volume applications, the leading companies pay hardware costs per unit. The new performance dynamics and cost have extended the range of viable applications these days. FPGA As Cloud Server: IoT devices usually have limited processing power, memory size and bandwidth. The developers offer interfaces through compilers, tools, and frameworks. This creates effectiveness for the customer base and creates strong cloud products with increased efficiency which also included new machine learning techniques, Artificial Intelligence and big data analysis all in one platform. Web Service Companies are working to offer FPGAs in Elastic Compute Cloud (EC2) cloud environment. Artificial Intelligence: As an order of higher magnitude performance per Watt than commercial FPGAs and (Graphical Processing Unit) GPUs in SOC search giant offers TPUs (Google’s Tensor Processing Units). AI demands for higher performance, less time, larger computation with more power proficient for deep neural networks. Deep neural network power-up the high-end devices. Google revealed that the accelerators (FGPAs) were used for the Alpha GO systems which is a computer developed by Google DeepMind that plays the board game Go. CEA also offers an ultra-low power programmable accelerator called P-Neuro. Low Power and High Data Rate FPGA: “Microsemi” FPGAs provides a non-volatile FPGA having 12.7 GB/s transceiver and lower poor consumption less than 90mW at 10 GB/s. It manufactured using a 28nm silicon-oxide-nitride-oxide-silicon nonvolatile process on standard CMOS technology. By this they address cyber security threats and deep submicron single event upsets in configuration memory on SRAM-based FPGA. These transceivers use cynical I/O gearing logic for DDR memory and LVDS. Cryptography research provides differential power analysis protection technology, an integrated physical unclonable function and 56 kilobyte of secure embedded non-volatile memory, the built-in tamper detectors parts and counter measures. Xilinx Unveils Revolutionary Adaptable Computing Product Category: Xilinx, Inc. which is leader in FGPAs, has recently announced a new product category which is named as Adaptive Compute Acceleration Platform (ACAP) and has the capabilities far beyond of an FPGA. An ACAP is a highly integrated multi-core heterogeneous compute platform that can be changed at the hardware level to adapt to the needs of a wide range of applications and workloads. ACAP has the capability of dynamic adaption during operation which enables it to deliver higher performance per-watt levels that is unmatched by CPUs or GPUs. Lattice Releases Next-Generation FPGA Software for Development of Broad Market Low Power Embedded Applications: Lattice Semiconductor, launched its FPGA software recently. Lattice Radiant targeted for the development of broad market low power embedded applications. Device’s application expands significantly across various market segments including mobile, consumer, industrial, and automotive due to is rich set of features and ease-of-use, Lattice Radiant software’s support for iCE40 Ultra plus FPGAs. ICE40 Ultra Plus devices are the world’s smallest FPGAs with enhanced memory and DSPs to enable always on, distributed processing. The Lattice Radiant software is available for free download. Who are the Major Players in market? The companies referred in the market research report include Intel Inc, Microsemi, Lattice Semiconductor, Xilinx, Atmel, Quick Logic Corp., Red Pitaya, Mercury Computer, Nallatech Inc., Achronix Semiconductor Corporation, Acromag Inc., Actel Corp., Altera Corp. The report incorporates in-depth assessment of the competitive landscape, product market sizing, product benchmarking, market trends, product developments, financial analysis, strategic analysis and so on to gauge the impact forces and potential opportunities of the market. Apart from this the report also includes a study of major developments in the market such as product launches, agreements, acquisitions, collaborations, mergers and so on to comprehend the prevailing market dynamics at present and its impact during the forecast period 2017-2023.